Panorama – How Was It For You? My foray into mainstream TV is over with my appearance on last nights Panorama. I did not know what to expect and was sitting rather nervously awaiting for the program to start. I am extremely grateful to the producer, Andy Bell for giving me the chance to take part, as I really enjoyed the experience. Two important messages came out of the of the program. One is the scam mail, and the other the Junk Mail, or ‘targeted marketing’ The former message is going to take a lot of work and is beyond my sphere of influence. The latter however is not. The shear scale of junk mail in Cornwall is huge with around 4000 tonnes of it having to be disposed of by Cornwall Council. The cost is also huge and ranges between £450,000 and £700,000 depending on how much is recycled or sent to Landfill. This is where I can have some influence. We may never be able to eradicate the plague of junk mail, but we can sure look into persuading the Government to add a surcharge, or levy on the producers of this junk. That way the cost of getting rid of this unwanted mail does not fall solely on the tax payer in Cornwall. I plan to raise push this point with the help of the Portfolio Holder and the support of my fellow Councillor to lobby Government to allow a levy to be introduced. From briefly speaking to senior officers and the Portfolio Holder they are in agreement that something should be done. Let’s hope that now this topic has been raised nationally we in Cornwall might be able to do something about it; as at the end of the day it is our money that is paying to dispose of this plague. On Monday the 4th July at 8:30pm, Panorama will be running a program hosted by Tom Heap called Why I Hate Junk Mail? Why am I blogging about it, well I will be on that program. The program is about the amount of junk mail we receive though the letterbox and the cost of disposing it, which is met by the tax payer. It all started about two months ago when I was contacted by Panorama asking if I would like to take part in their show. At first I thought it was a wind up as what would Panorama want me with. They explained that they had been reading my blog and liked the articles I wrote on waste, recycling and the costs. I agreed (still numb from the shock) to take part. A few weeks later a team of four, including Tom Heap turned up in Porthleven to start filming. I thought they would ask for my thoughts and that would be it and all over in a blink of the eye. Little did I know, but they stayed with me for half a day filming me and Tom. Now I don’t know how much will end up on the cutting room floor, but the producer did say I get a good airing. 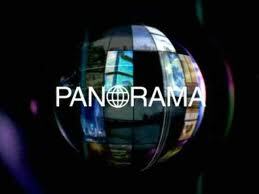 Firstly, it was a great honour to take part, as I have grown up watching Panorama and have always liked it. Secondly, I was really proud that my blog which started out rather tongue in cheek now gets read by many people not just locally, but nationally. I have only just been allowed to talk about it, because I agreed to keep it embargoed till nearer the time.